The Moremi Game Reserve covers an impressive 4, 871 sq km in the eastern section of the Okavango Delta. Moremi has a great diversity of plant and wildlife containing a wide range of habitats including mopane woodlands, acacia forests, floodplains, reed beds, riparian woodlands, and lagoons. It is described by most as being one of the most beautiful wildlife reserves in Africa. In this tranquil and serene environment one can expect to see a prolific amount of game at any point during the year, only varying slightly with the seasons. Birdlife in Moremi is plentiful with over 500 species ranging from water birds to shy forest dwellers. In addition one can often find different varieties of geese and ducks as well as an outstanding heron population. Game viewing is just as remarkable as the Reserve offers a range of elephants, buffalo, giraffe, lion, leopard, cheetah, hyena, and jackal to name a few. There is a full range of antelope-both large and small-including the red lechwe as well. The park is most well known for its significant wild dog population that is so commonly dwindling elsewhere, but remains a regular sighting in Moremi. 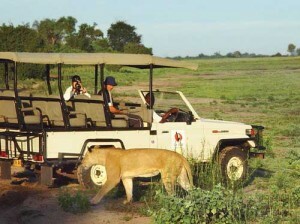 The best time to visit is in the dry season where game viewing is at its peak from July to October.